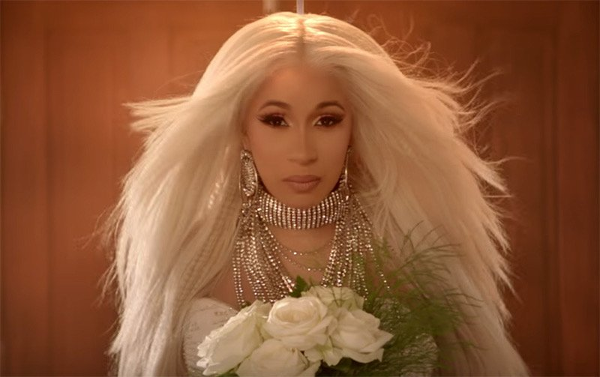 Cardi B Plays A Scorned Bride In 'Be Careful' Visuals + Police ID Men In Offset's Crew Who Beat Up Autograph Fan In The Most Biazarre Way! Cardi B isn't the one a cheating a man should mess with. She'll take you out with zero f*cks given. The pregnant rapper just released the visuals for "Be Careful," a track off her debut album Invasion of Privacy. And the video treatment is a whole movie. Almost like an Old Western. 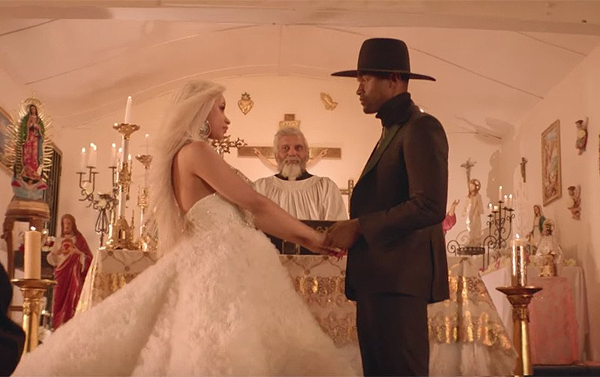 Directed by Jora Frantzis, the "Bodak Yellow" rapper is a not-so-blushing bride in a white studded gown as she stands at the alter about to marry the man she's supposed to spend the rest of her life with. What's supposed to be a joyous time quickly turns into sorrow as Cardi rolls up to the same church in all black. But, this time, she's attending her hubby's funeral. While rapping about how sick he makes her, she shuts the casket and it's lights out for his a**. Can any of you all relate? Cardi's fiance Offset experienced a brush with death last week after he got into a serious car crash in Atlanta. Luckily, he's doing fine. After coming home from the hospital, he shared flicks of the aftermath, showing his mouth full of blood, his neck in a brace and his hands and arms all scratched up. In case you missed, check out the full story HERE. Mood I like it ! !INVASION OF PRIVACY !! Ha! She's so funny. And we're glad she's in good spirits. There's an update surrounding that brawl that broke out between Offset's crew and an "aggressive" autograph seeking fan outside of the Met Gala. Investigators have identified three of the men who were seen beating down a fan, reportedly named Giovanni Arnold, after he started popping off when Cardi wouldn't give him an autograph. Watch the clip above. According to TMZ, the police was having trouble getting information about the brawl. Reportedly, Cardi and Offset didn't cooperate. However, they hit the jackpot with a huge lead they weren't expecting. During the Met Gala, someone stole one of Offset's chains from his hotel room. Since he filed a police report, investigators in that case created a list of names of everyone who had access to the Migos' rapper's room. They were able to reach out to the investigators working the fight case and handed over all of the names of the people who had access to Offset's room. When they got that list, investigators handed it to cops handling the assault case. Those cops ran background checks on the suspects, checked surveillance and cross-checked the names on social media. Sources tell us cops struck gold and found images that matched the same gear they were wearing in the assault captured on camera. We're told the 3 men are currently in Georgia. They're not officially suspects ... at least not yet. By the way, the guy who got beat up -- Giovanni Arnold -- has filed a lawsuit against Cardi and Offset. He's def tryna make a quick come up.